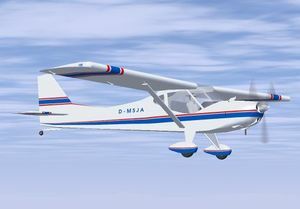 B&F Technik Vertriebs GmbH single piston engine aircraft entered production in 1995, a improved version of the Mark 1 which had entered production in 1990. The FK9 starts on the runway with its propeller ticking over in the breeze. Due to the breese it is gently rolling backwards as well, and a quick tap on SHIFT B puts on the brakes. Starting procedure is as follows, as far as I have figured out - tap "}" for the magnetos and then "M" to increase the mixture. Next press the 's' key (changed from the space bar on older FG versions for starting ) and then increase the throttle. Release the brakes. Being a very light aircraft, the FK9 accelerates rapidly. Being a tail dragger, the use of rudder is required to keep straight, but take off is accomplished quickly, without enough time to run off the broad runway at KSFO. It would do well to familirize onself with the v speeds, as everything is in kmh, which is about half the speeds they would be in knots. I noted with some satisfaction of a car-type ASI with its left to right readout, the type I have been suggesting in the forum, for actual aircraft. Flying an airplane with a mouse for controls was never going to be easy, therefore the aircraft is very sensitive in pitch as far as the mouse control goes, so the flight was a series of oscillations that would have no doubt brought a strong reminiscence of stomache contents in the first few minutes if it was the real thing. Throughout the flight wild changes in pitch and altitude featured prominently. The exterior and interior aircraft model is pleasant enough, though a problem with my machine showed some black areas instead of the correct texture. An ASI, altimeter, VSI and RPM gauge completed the instruments layout, with some switches down to the left of the panel, none of which could be clicked, although highlighted using cntrl-c. I decided to bravely and foolishly land on the grassy knoll next to the airport, and approaching it seemed at cruise speeds, I slowed enough, with power down , to a rate of 400 fpm, misjudging the height, the aircraft settled down very hard and promptly nosed over ruining the fine 3 blade prop that lent so much of a purposeful feel to the aircraft. Overall a delightful experience, a fine introduction to the new crop of LSAs. The model is attractive in appearance, and as far as I could judge, accurate in characteristics, never having flown a real one, I would only guess. It seems good to keep in mind that the maximum speed for LSAs are cruise speed limits, which can be easily exceeded if one points the nose straight down, so these light aircraft can crash as heavily as many faster aircraft if they stall close to the ground. 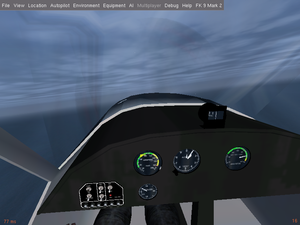 The screenshot shows an interior view of the aircraft in a climb in FG 2.4. Note the excellent perspex reflective effect on the transparent areas, and the basic instrumentation. This page was last modified on 4 August 2016, at 09:54.